Apparently, my son’s car seat is a very comfortable place for an afternoon nap! This is one of the chickens that I got from a friend last month. She is an Ameraucana, so I’ve just been calling her “one of those ameraucanas”, but a sweet little bird like this needs a proper name. Contest Time! Like I said, she is an Ameraucana and lays blue/green eggs. She is a deep golden brown color. She is very sweet and lets me pick her up and carry her. She is smart because she can get out of our 6 foot fencing, somehow. She is sociable and would come into the house to hang out if we let her. And she is not a fan of male attention (she runs away from the rooster any time he tries to have his manly way with her). So what should I name her? Send me all of your suggestions! Kaia is the contest judge and will pick the winning name. The winner will get something I’ve made. I’m not sure what yet… but it will be great!! Make sure you leave a way to contact you if you don’t have a blog. Have your entries in by Sunday, Sept 20th. I’ll announce the winner on the 21st. Good Luck! This entry was posted in Chickens/Ducks. Well, two obvious options would be either “Thelma” or “Louise.” It’d be a shoe-in if you had another one that liked getting in the car! If she likes being in the car, I’d have to recommend Danica after Danica Patrick the racecar driver! My name would be Francine Flying Fairy or Flying Fairy Francine. I suggest Madam Chanticleer or Lady Liberty. Or Pocahantas the Ameraucana. I will have to think about a name, but may I just say that is one of the funniest pictures that I have ever seen. I will add this to my blog tomorrow, this is a great contest! I say Miss Daisy, as in Driving Miss Daisy. I love Miss Daisy as a name but will submit Feisty Woman. i hope it is not wrong of me to have more than one suggestion. i just can’t help myself! 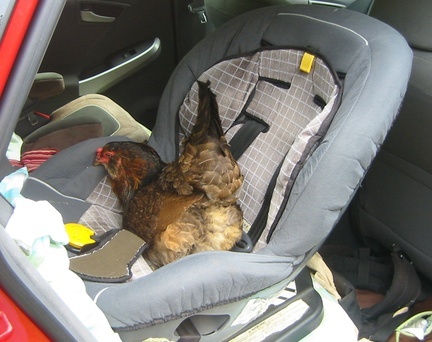 Since she is such a great escape artist…how about a name that one of my readers suggested for one of our chickens. (We used it for a New Hampshire Red)…..LUCINDA….as in Loose-in-da Yard! Isn’t it the cutest chicken name ever? hmm, i kinda like Miss Cluckity for her! or Miss Clucksworth! From her description, the first name that pops into my head would be “Anne” from Anne of Green Gables Love the picture of her in the car!